Business Owners Need Safety Too! We can help you find affordable options for your monitored business security too. Just call to learn about the options available for you now. Our customer service representatives are standing by to answer your questions today! ADT: The Most Trusted Name in Home Security! You'll get easy to set up, easy to use, top of the line home security equipment. Help protect your home and your loved ones every day and night! Each piece of equipment in your home security system is specifically designed to create optimum safety. Each item performs a particular home security function that adds up to build a safe haven for you and your family. 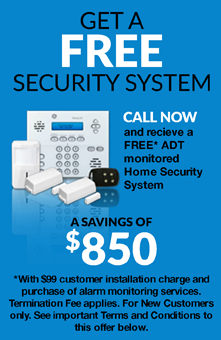 Protect Your Home is an Authorized ADT Security dealer. Dependable home security equipment is an essential element in your monitored home security system. The Master Control Panel is the center of your home security command capabilities. It's like the brain of your home security system. Your Control Panel connects with all the equipment and allows 2-Way Voice communication if you select the upgraded ADT home security monitoring service. With the keychain remote, users can easily arm and disarm your entire home security system with one simple and convenient touch of a button. It includes a long-lasting battery so you don't have to worry about losing power. A warning signal will let you know when the battery is getting low. Door and window sensors are easy to install, wireless home security sensors that emit an audible signal when doors or windows are opened or closed. You can monitor windows and doors from unauthorized entry by attaching these simple devices. Your high decibel alarm siren is designed to loudly alert people inside and outside your home if your home security systems are breached. The sound is often enough to scare away potential invaders. It automatically signals the ADT security monitoring centers, which will immediately contact you to help assess your safety. Don't risk your family's safety in a power outage. Your ADT monitored home security system include a dependable backup battery that keeps the energy supply operating in your home security alarm system without traditional power sources. ADT Monitored Security decals and yard signs clearly advertise that your family has a home security system in place . Every home security monitoring service comes complete with a very visible ADT home security yard sign and window decals. Make sure you let criminals know that your home is monitored. Your home security system and alarm monitoring services come with professional installation for only $99.